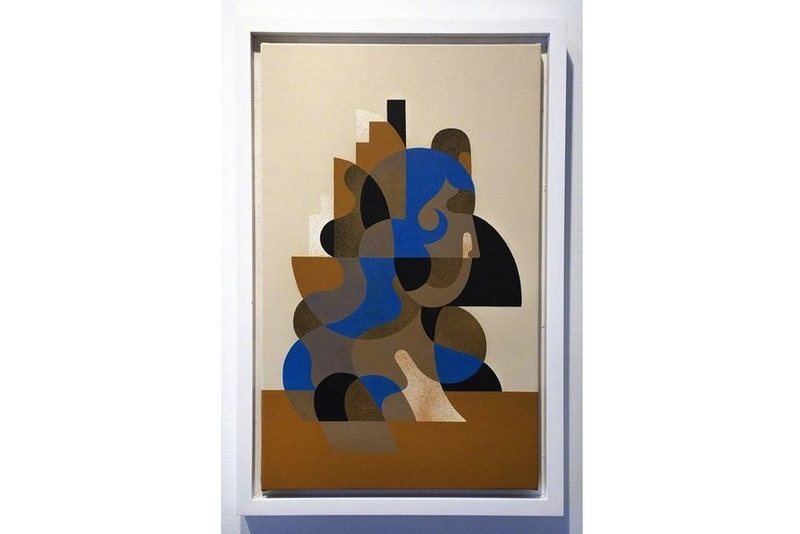 Since the early 1900s, abstract art has formed a central stream of modern art. It emerged from the artists’ desire to create works unrelated and unrestrained by visual references in reality. 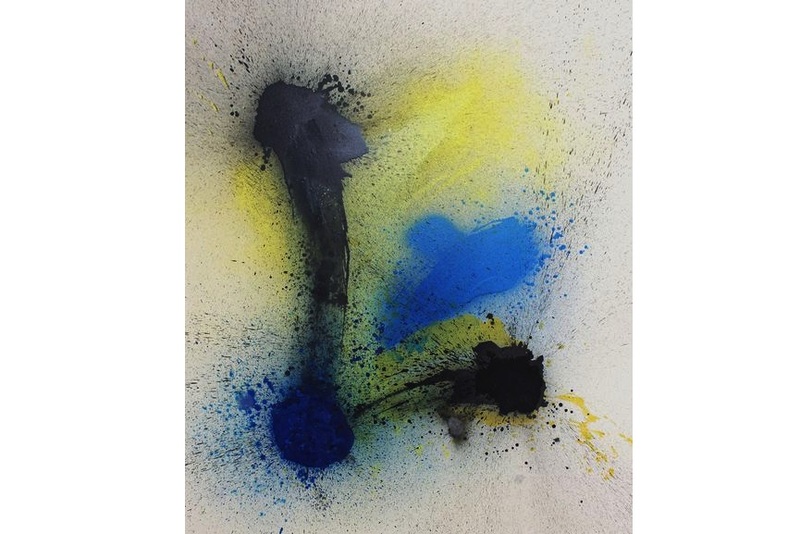 This versatile art genre uses colors, shapes, forms and gestural marks to achieve a unique aesthetic and in many cases, a deep emotional response from the viewers. Abstract painting has come a long way since its beginnings, proving to be as a versatile field for experimentation and development of new styles and techniques. It continues to be a profound influence on contemporary artists who make the most out of shapes, surfaces and the rhythm of movement, not relying on straight-forward visual content and narrative – and artists working on the streets are no exception. We bring a selection of works by urban artists who are redefining this traditional art genre. 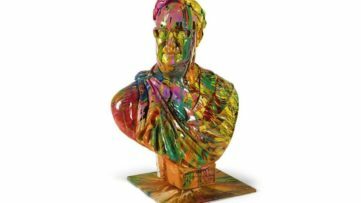 All of them treat abstraction in a unique way, molding it into their personal visual vocabularies. A world-renowned German graffiti art duo, Moses & Taps made their name with their art collective TOP SPRAYER. Their first project was to paint 1000 trains all over the world in 1000 days, using each other’s names. Their ever-changing pseudonym, which shifts between Moses & TapsTM, Erni & BertTM, TopsprayerTM and AliasTM, helps conceal the true identities of its members while still defying the unwritten laws of graffiti. Harnessing the power of a spray can, the piece METUSIA™ fuses the distinct visual language of graffiti with abstract art. While CRASH has been at the forefront of the Graffiti movement in France, Remi Rough is one of the pioneers of the movement in the UK. CRASH is known for dealing with the imagery of comics, giving it his own distinct flavor, while Remi Rough combines the visual language of avant-garde movements such as Suprematism with a totally modern expressionistic energy. In 2013, these two talented artists collaborated on a piece Untitled. The result embodies CRASH’s unique graffiti pictorial inventory and Remi Rough’s unique brand of abstraction. An acclaimed French street artist, Tanc has developed his unique visual language in which he explores the possibilities of the line. Embracing spontaneity, he works towards a synthesis of his name, of tags, of individuals, of music, of life. His pieces are the result of a perfect balance between consciousness and unconsciousness. An exploration of formal abstraction, Untitled embodies a prevalence of action, perfection of the gesture, acceptance of the unexpected, and expression of a strong singularity. One of the pioneers of Urban Art in the Czech Republic, Jan Kaláb explores infinite variations in geometry, depth, time and motion. His works demonstrate a perfect balance between shapes and minimalism, generating amazing effects of depth and dynamism. 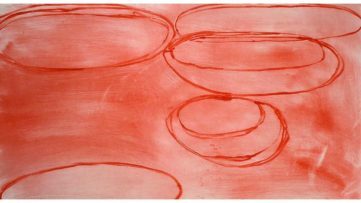 The piece Red Cloud 1249pm is a great example of his brand of abstraction. 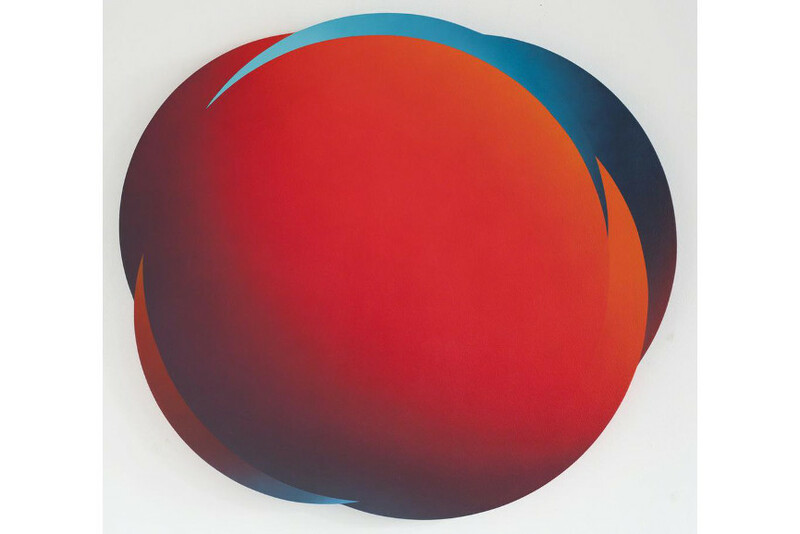 Playing with circles, the artist conveys organic imperfection and swing through his work. Inspired by the basic building blocks of the geometric world, Augustine Kofie has developed a retro-futuristic aesthetic which transplants these shapes and angles into a soulful, organic, yet highly mathematical form of abstraction. 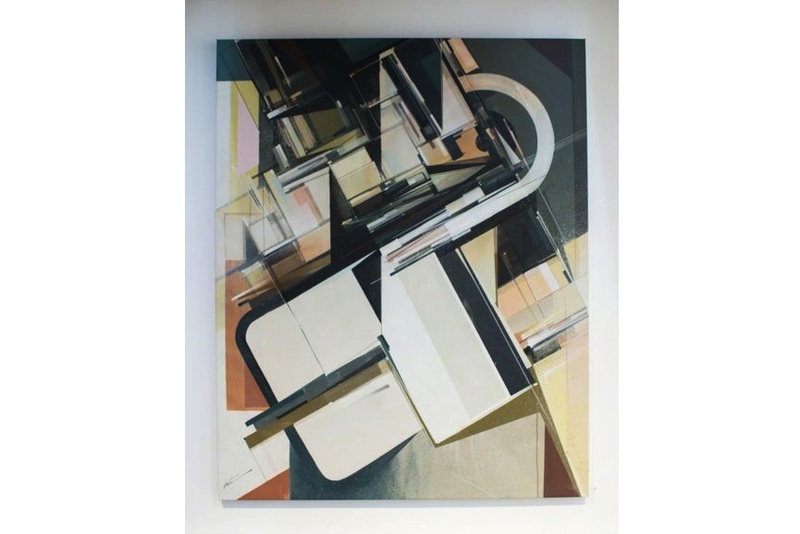 Finding harmony in opposites, he creates intensely detailed and complex works with earth-toned compositions reminiscent of Italian Futurism. 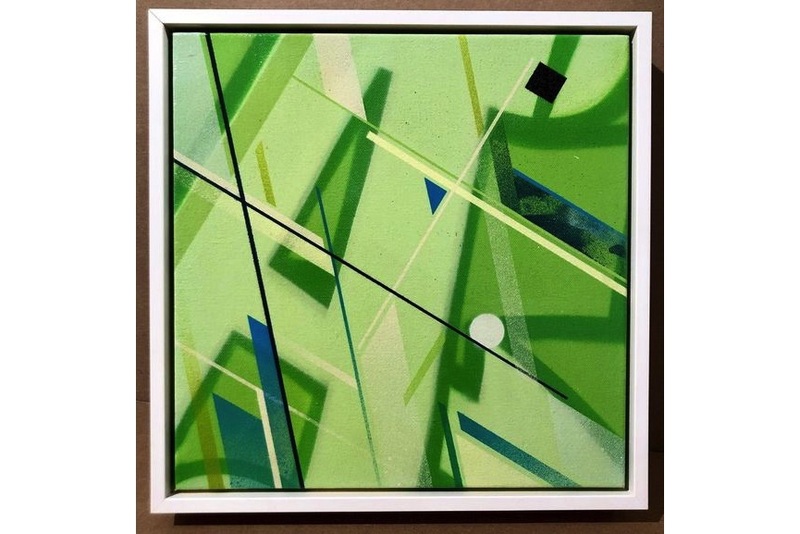 Executed in his distinct visual language, Inventorium 3 exhibits mastering of color and layering, points of perspective and arrangement. An acclaimed French urban artist, Remed combines mathematics and soul, seeking precision while always listening to his gut. He is inspired in equal measures by classical 20th-century artists such as Modigliani and Léger, as by the Moroccan art of Zellige, revitalizing these movements, making them contemporary and giving them a feeling of freshness. The piece L’homme Oiseau conveys a harmonic purity combined with the flow, the energy of the line. It speaks a universal language of form and color that anyone can relate to. 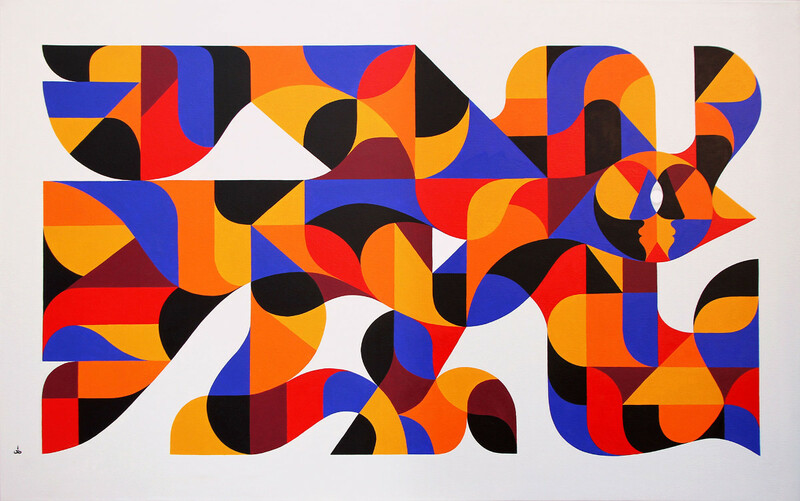 Australian artist Reka One developed a new, recognizable style of art combining surrealism, abstraction, and street art. 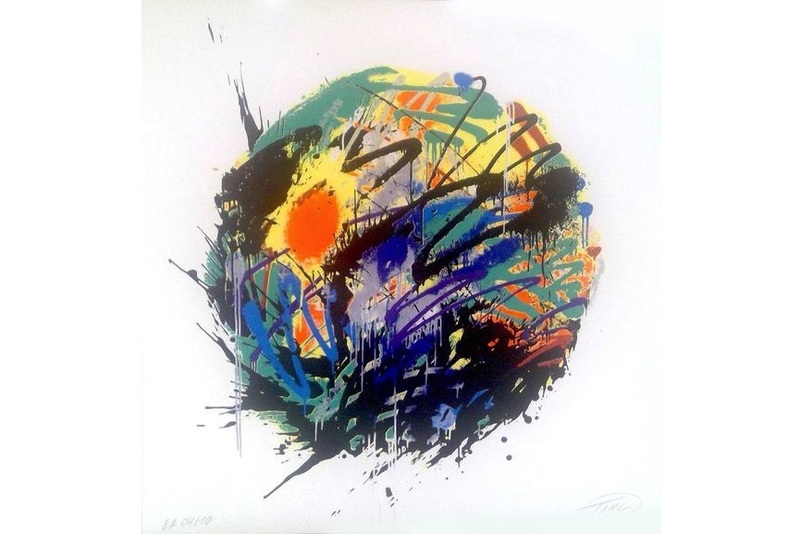 Expressing himself through bold colors, dynamic movement and strong lines, he creates works which open dialogues between the viewer and their surroundings. Created in 2018, The Drifter features a pseudo-human form which appears recognizable but isolating, playful yet eerie. On the other hand, this meticulously detailed piece exhibits an incredibly diligent, almost obsessive attention to technical proficiency.